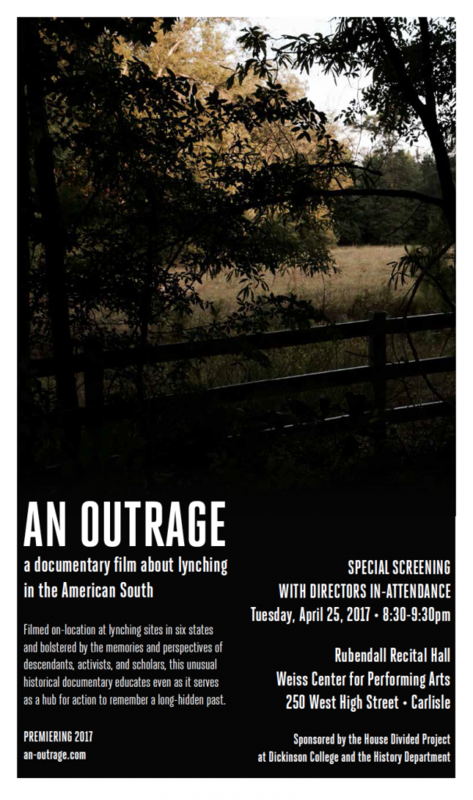 On Tuesday evening, April 25, 2017, the House Divided Project is hosting two major public events at Dickinson College: an open house at its studio on 61 N. West Street from 4-6 p.m. and then a special premiere of the powerful new documentary film on the legacy of lynching in the American South, “An Outrage,” at the Weiss Center for Performing Arts from 8:30 p.m. to 9:30 p.m. The open house will feature a tour of our newly renovated Civil War era reading room and the presentation of special augmented reality (AR) exhibits on 19th-century Dickinson College history. Various History students at Dickinson have contributed to the making of these exhibits, including: Christina Braxton, Fiona Clarke, Trevor Diamond, Liam Donahue, Amanda Donoghue, George Gilbert, Sarah Goldberg, Alden Mohacsi, Alexia Orengo Green, Samantha Reiersen, and Ian Ridgway. “An Outrage,” is a new 30-minute documentary film about the legacy of lynching from Virginia-based filmmakers Hannah Ayers and Lance Warren of Field Studio. The Southern Poverty Law Center has already promised to help distribute this provocative yet inspiring film to thousands of secondary school classrooms around the country . The House Divided Project at Dickinson College and the History Department are proud to host the first Northern screening of this powerful film.